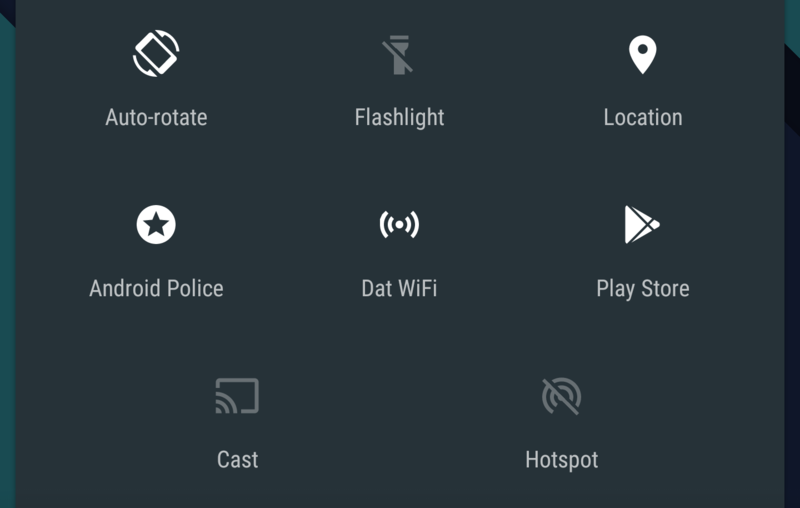 In Android M, the System UI Tuner included a Broadcast tile that allowed users to create their own custom tile to be added to the Quick Settings area. However, users had to be savvy enough to know how to create that tile and then use an app like Custom Quick Settings to personalize its look and actions. It's safe to say that the feature wasn't ready for primetime and only enterprising and techie users could benefit from it. With Android N, custom tiles will be possible to implement directly by the developers for their apps. The N documentation explains that this is part of the reason Android N has a Quick Settings area with pagination and user-editable toggles. The new API lets developers define new Quick Settings tiles for "controls or actions that are either urgently required or frequently used" and, preferably, not just shortcuts to launch apps. Developers can then surface these tiles to users and let them add them to Quick Settings with a drag and drop. I imagine this can easily be overused by developers, although you still retain control over showing or hiding tiles in Quick Settings, but it can also be extremely helpful in some instances. Imagine changing your WhatsApp or Hangouts or Telegram status to "Super Busy", switching to another Pocket Casts playlist, starting a run or hike in Runtastic, Shazaming a song, switching your wallpaper, or more, just with a simple tap on a toggle. That could be so useful. I'm sure I didn't even scratch the surface there, so chime in with your possible scenarios for different apps and their toggle ideas.